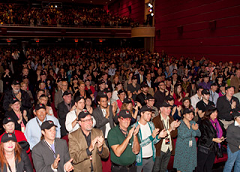 The Savannah Film Festival is a must see Savannah Event presented by SCAD October 29- November 5, 2011. The film festival which is hosted by the Savannah College of Art and Design features the best in independent and innovative film from around the world. SCAD brings in feature-length films to two-minute shorts that presents a full range of cinematic creativity from both award-winning professionals and emerging student filmmakers. Festival attendees can listen to panel discussions and presentations by visiting artists who offer movie buffs the unique opportunity to experience the art of film while interacting one-on-one with their favorite filmmakers. From the moss-draped trees and shaded parks to the shops and ships of River Street, Savannah attracts millions of visitors each year, including film crews who take advantage of the city's ambience, mild year-round climate and easy-going lifestyle. Come and be a part of this annual tradition in beautiful Historic Savannah when you plan your autumn Savannah vacation. 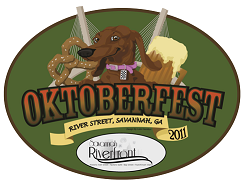 Savannah Oktoberfest 2011 is a Savannah Getaway along the Savannah Riverfont begining September 30 - October 2 that your family will not want to miss. Head down to the Riverfront for a Wiener Dog Race, Bratwurst tasting, Chicken Dancing, Fireworks and much more! Enjoy a variety of German beverage stations serving up a one of a kind beers and wine. Coke products and food vendors such as Repicci’s Italian Ice, Savannah Kettle Corn will also be available. There will also be four plaza's full of arts & craft vendors, Rhinelanders Oompah Band and additional headline entertainment to be announced later. Plan your Savannah Getaway this fall at one of Romantic Inns of Savannah’s distinguished bed and breakfast. The Savannah Inns welcome Savannah Jazz Festival 2011 that begins on September 18 and concludes on September 25. Over the years the Savannah Jazz Festival has featured some of the best artists in the business from Lionel Hampton to Jimmy Smith. 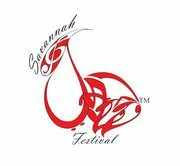 All events at the 2011 Savannah Jazz Festival are FREE and open to the public. 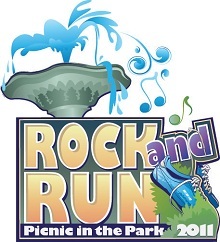 Click here for the 2011 Line-Up. When you come to the Savannah Jazz Festival, book you lodging with one of these romantic Savannah Inns. Haunted Harbor Cruises are a favorite Savannah attractions each year on Friday nights beginning in April and ending in October. Boarding begins at 9pm and the River Street Riverboat leaves port at 9:30pm returning at 11pm. As the seasons begin to change and the time of Halloween nears, wouldn't it be a delight to take a Haunted Harbor Cruise and discover if old habits and practices of hags, haunts and 'Da Buzzard Man' have long gone from Georgia or does the veil of mysticism still cast in shadow influence over the sea islands. Come and see for yourself as you voyage along the Savannah River on board the River Street Riverboat followed by a restful night in one of Savannah Historic Inns.